GFL’S extensive industry knowledge, attention to detail and total commitment to quality have driven us to create an exceptionally robust and consistent manufacturing process. Bitrex is the brand name of the most bitter substance yet discovered. It's now over 50 years since serendipity presented Macfarlan Smith with Bitrex, and we want the world to know! GFL Environmental is proud to be the lower mainland’s premier environmental services company. Click here and enter the Address or City and Province or Just a Postal Code to locate places near you. 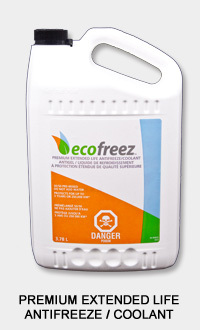 GFL Environmental Inc. is the largest and most experienced antifreeze recycling service in Western Canada. With GFL you will discover the finest quality premium recycled coolant products in the industry, exceptional customer service, quick delivery and highly competitive prices. GFL manufactures a full line of premium recycled coolant products that meet OEM performance standards. 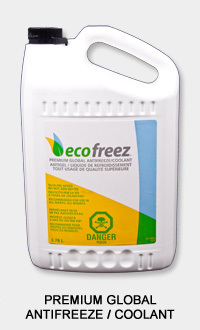 Since 2006; repair shops, fast lubes, commercial, fleet, car dealers, government and retail operations look to and trust GFL’s Ecofreez as a high quality product. Thoroughly tested, all Ecofreez products not only meet the highest quality standards, but the Ecofreez brand uses creativity, innovation and green practices to reduce costs and minimize the impact on our environment. When you partner with GFL you remove your cradle-to-grave liabilities associated with coolant disposal. 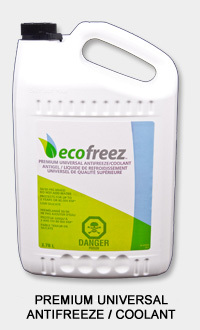 We collect all quantities of used antifreeze/coolant as long as its ethylene glycol based. Call us today. We can take away all types and colours of your used antifreeze. They don’t need to be separated. Our state of the art vacuum distillation process doesn’t care what colour comes in…we can help you.